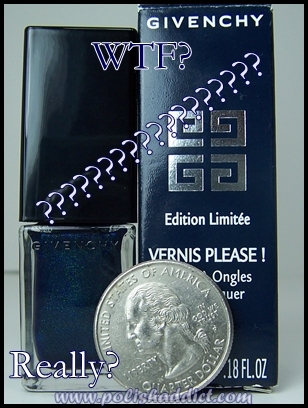 I am appalled by the size of the bottle of the limited edition (of course) Givenchy Dandy Moiré. Every other company on earth sells this amount of polish as a ‘mini’. The size itself actually isn’t the issue, I love minis. The problem is the size to price ratio. Seriously? A 15 dollar ‘mini’? It doesn’t even apply well. The fomula is too thick and it chips fairly easily. At 15 dollars per .18 fl. oz., it needs to apply perfectly. It needs to apply like Jesus himself is doing my nails. Not only that but it needs stay on my nails, unchipped, for the rest of my life. Why did I buy this? Am I really such a blind consumerist that I can’t resist buying something I know isn’t worth the amount of money I’m spending? Ugh, I don’t really have an answer to that question, there’s just something about this color that drew me to it. It’s not as impressive in real life as it looks on Sephora’s website. (Of course. Oh man, how I abhore Sephora.) However, I admit that the blue and green shimmer is mesmerizing even though it’s not as blingy as advertised. What was really… just… bizarre… about this color was other people’s reactions to it. I wear nail polish every single day of my life. No one cares. I hardly ever get compliments, comments, anything. But, Givenchy Dandy Moiré was a topic of conversation with almost everyone I encountered for 3 days that I wore it. I broke my professional color vow and wore it last Friday during my office’s casual day. The female attorneys loved it. So much so that yesterday, one of the victim advocates asked me where she could buy it or something like it locally. 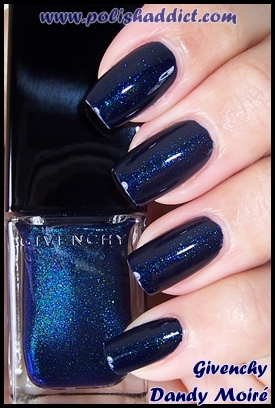 I told her that she should skip the unreasonably priced haughty Givenchy and check out OPI Yoga-ta Get this Blue which is basic and readily available in our nail polish deficient little town. Then Friday night at dinner, my friend’s boyfriend and his friend noticed Dandy Moire. They thought it was black and stated that it “didn’t suit my skin tone”. Even though I knew that they were teasing me in response to me mocking college football, I launched into a tirade about the merits of navy shimmery nail polish on dark skin. I’m sure they regretted mentioning it at all after I imparted more information about nail polish than they ever wished to know. Saturday night, a very drunk boy awkwardly hit on me at a bar by complimenting my ‘black’ nails. Even my male roommate who only discusses nail polish in the context of taunting me, commented on Dandy Moire. He also thought it looked black. The strange thing is that I wear black and ‘almost black’ polishes all the time. No one ever notices or says anything. So what was it about this particular color that made people feel the need to comment on my nails? I’m completely baffled. I guess there is just something intangible about this color that makes it more strikingly noticeable. I still think the 15 dollar price tag is absolutely ridiculous, but I guess I like Dandy Moiré.